We offer B.A. degrees in French, French with Teacher Licensure, German Studies, Spanish, and Spanish with Teacher Licensure, as well as academic minors in Classical Studies, French, German, Japanese, Portuguese and Brazilian Studies, Russian Studies and Spanish. Courses also include the study of American Sign Language, Arabic, Chinese, and Italian. At the graduate level we provide opportunities for a Certificate Program in Spanish, a Master of Arts in Spanish, and a 3+2 Bachelor/Master combination. Beyond campus, the Department continues its collaboration with the NC World Language Exchange, providing language courses across the UNC system. Recently, in cooperation with NCSU, we have offered Hindi-Urdu and Ancient Greek. Many of our language programs have active student language clubs, and our faculty members develop and accompany students abroad in Chile, France, Germany, and Spain. We are proud that we successfully meet UNCW's goal of preparing students to become global citizens. Undergraduate students have many questions concerning their foreign language requirement statement on their degree audit. Learn more in-depth details about the FL Requirements. Undergraduate students wanting to continue the study of a language previously studied must take the FL Placement Tool to be placed into the correct level. Dr. L.J. Randolph was awarded a College of Arts and Sciences Summer Curriculum Development Initiative Award. Dr. Amrita Das was awarded a College of Arts and Sciences Summer Curriculum Development Initiative award. Derrick Miller was awarded a Summer Pedagogy Development Stipend from the Center for Teaching Excellence for his project, "Study of Core Courses and Requirements for World Languages Umbrella Degrees." Dr. Emmanuel Harris was awarded a College of Arts and Sciences Pilot Grant for his summer research. Dr. Michelle Scatton-Tessier, chair, was honored with the Inconvenient Woman Award from the Women's Studies and Resource Center. Drs. Boomershine and Randolph hosted a group of Spanish teachers, graduate students, and advanced undergraduates to Santiago, Dominican Republic in July 2016. Dr. Regina Félix was awarded a Global Citizenship Award from the Office of International Programs. Dr. Scott Jualll has been awarded funding from the International Programs Advisory Committee towards his expenses to France. Dr. Emmanuel Harris and student Jasmine Beck have been awarded $3,500 in funding by ETEAL for their SURCA project to take place in Spring 2016. 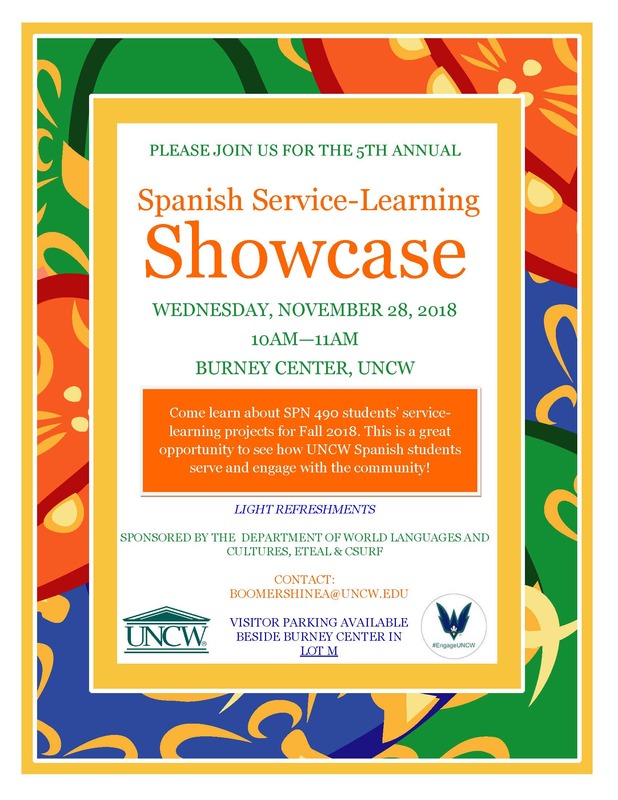 Dr. Amanda Boomershine's SPN 490: Service learning and research class (Fall 2015) conducted oral history interviews that can be viewed on the UNCW Randall Library as a digital collection entitled: Somos NC: Voices from the North Carolina's Latino Community. Dr. Ashlee Balena was awarded the Excellence in e-Learning Award by the Office of e-Learning in 2015. Dr. Pascale Barthe was awarded a Charles L. Cahill Award for her research proposal "Tales of Empires: Seventeenth-Century French Travelers in Persia and India" in 2015-16. Founded in 1947 as Modern Languages, the Department of World Languages and Cultures (WLC) is a community of scholars dedicated to excellence in teaching, research, and service to local and global communities. Through innovative and substantive pedagogies, the Department seeks to promote student understanding of the linguistic and cultural subject matters it teaches. We prepare students to acquire proficiency in world languages at all levels and enhance the students' effective communication, creativity, critical thinking, greater awareness of the world's peoples, and interpersonal skills, as well as their understanding of their own language. We are dedicated to creating an atmosphere of intellectual exploration and exchange in order to develop students' research interests and abilities. Through teaching, applied learning, service, and research, we serve as a bridge connecting local, regional, and international concerns. Spanish major Jessica Aiken has received a Fullbright English Teaching Assistantship in Spain for this coming year . ¡Enhorabuena, Jessica!